Whether they’re looking to modernize their infrastructure, find meaningful insights from their data, or take advantage of industry-specific expertise, our customers rely on partners to help them on their cloud journey. Our Google Cloud ecosystem—including reseller partners, services partners, technology partners, and open source innovators—plays that role, and over the past year we’ve made significant investments in how we support that ecosystem. Wide-ranging support from our partners for Anthos. A commitment to a robust open source partner community. Expansions of compute and serverless partnerships. New specializations for our reseller and services partners. New partner integrations focused on improving collaboration for end users. Updates to our approach to MSPs. And of course, our 2018 partner award winners. Anthos, Google Cloud’s new hybrid platform, enables businesses to write their apps once and run them anywhere—in their own data centers, Google Cloud or another cloud. For companies that want to leverage existing investments in their own data centers, we have partnered with Cisco, Dell EMC, HPE, Intel, Lenovo and VMware, each of whom have committed to validating Anthos on their solution stack and providing reference architectures, giving our mutual customers a choice of hardware based on their storage, memory, and performance needs. You can learn more about Anthos in our blog post. Since Google’s founding, open source has been at the core of what we do, and you can see this reflected in our contributions to projects like Kubernetes, TensorFlow, Go, Android, and many more. We’ve always seen our friends in the open-source community as equal collaborators, and not simply a resource to be mined. Today, we’re extending our long-standing commitment to, and participation in, the open-source community with a range of strategic partnerships. We’ll be offering managed services operated by open-source centric companies CloudBees, Confluent, MongoDB, Elastic.co, Neo4j, Redis Labs, InfluxData and Datastax that are tightly integrated into Google Cloud Platform (GCP), providing a seamless user experience across management, billing and support. This makes it easier for our enterprise customers to build on open source technologies, and it delivers on our commitment to continually support and grow these open source communities. By offering an elevated experience similar to Google’s native services, we’re working alongside these creators and supporting the growth of these companies’ technologies to inspire adoption. You can learn more in our open source partnership blog post. Last week, we announced the expansion of our Compute Engine virtual machine (VM) offerings to include new Compute-Optimized VMs and Memory-Optimized VMs. Both are based on 2nd Generation Intel Xeon Scalable Processors, which we delivered to customers last October—the first cloud provider to do so. In addition, these processors will also be coming to our general-purpose VMs. This means you’ll have access to a complete portfolio of machine types to successfully run your workloads across a wide range of memory and compute requirements. Google Cloud also became the first Cloud provider to offer availability for the NVIDIA Tesla T4 GPU back in November 2018. The T4 GPUs are optimized for machine learning (ML) inference, distributed training of models, and computer graphics. We’re also expanding our ecosystem of serverless partnerships. Serverless computing helps developers focus on writing code that delivers business value, rather than worrying about the complicated underlying infrastructure. Our unique approach to serverless makes it easy for you to tap into a full stack of additional services and an entire ecosystem of deep partnerships with industry leaders such as Datadog, NodeSource, GitLab, and StackBlitz, which provide integration support for Cloud Run across application monitoring, coding, and deployment stages. To learn more about our new serverless offerings, check out “Announcing Cloud Run, the newest member of our serverless compute stack”. Sharing and storing web-based files has quickly become an indispensable part of day-to-day work, but corralling those files across multiple tools can be difficult. We want to make it easy for you to collaborate no matter the file, no matter the app. Today, we announced a new integration with G Suite and Dropbox to make this easier. Now, Dropbox Business customers can create, save and share G Suite files—like Google Docs, Sheets and Slides—right from Dropbox. With this integration, G Suite files will show up when you search in Dropbox. You can also open up different file formats like .docx, .xlsx or .pptx files from Dropbox in G Suite and then save them back to Dropbox in whichever format you prefer. (While we’re on the subject of file formats, we’ve also made it easier to collaborate in Microsoft Office files in real-time. Read more about that in this post). Many customers need partners with experience in a particular area to help them build advanced solutions to their challenges, and run and maintain them over time. To help customers identify the right partner, we provide partner specializations. We offer 10 different partner specialization areas, a significant range that allows customers to search for the right blend of relevant depth to address their specific needs and requirements. Partners who have earned a specialization have multiple individuals on staff with the highest level of certification, demonstrated and documented customer success stories, and have passed a rigorous capability assessment from experts on our professional services team. Marketing Analytics Specialization Partners, with the unique skills to collect, transform, analyze and visualize data, and then use the insights gained to optimize marketing strategy and activations. You can learn more about our specialization program for partners here. Our ecosystem of MSPs are a key part of our go-to-market approach. Today, they are helping many customers build, scale, manage and support modernized IT strategies with Google Cloud at their core. Qualified Google Cloud MSPs have completed trainings and extensive verifications to ensure they have the ability to manage, monitor, remediate and optimize workloads on GCP. We provide these partners with numerous resources to help them serve customers, including support from dedicated MSP technical account managers, customer engineering, and online and in-person community resources. At Next, we will be introducing an MSP Initiative badge for qualified partners, making it easier for our joint customers to discover partners who can help them to accelerate their Google Cloud journey. To learn more about our MSP initiative, please visit here. 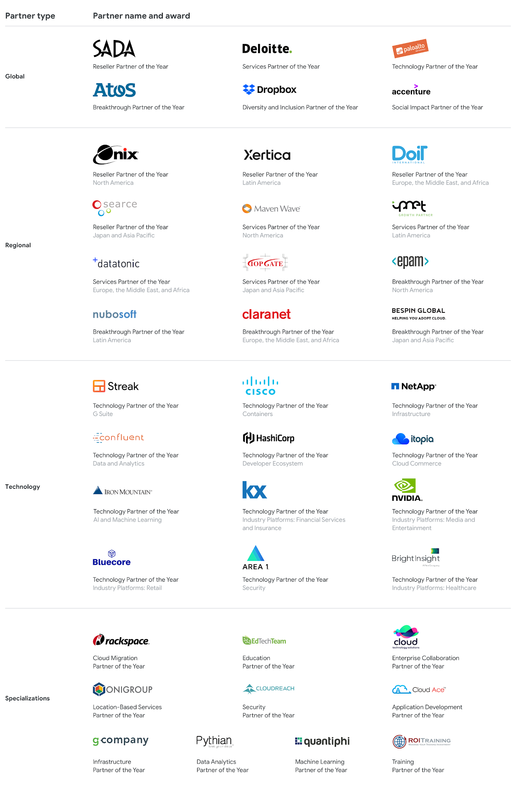 Each year we look forward to the opportunity to recognize our amazing partners helping our customers at every stage of their journey to the cloud. Please join us in congratulating our 2018 winners. We’re so grateful for the ways our partners support the needs of our customers, and we look forward to welcoming many new partners into our network in 2019. To learn more about our program, find a partner, or become one, visit our partner page.